A few useful links for this week’s roundup include some great content from DesignM.ag, Function, DarkMotion, DzineBlog, GoMedia and ScrnShots as well as an interesting and useful app named Backboard. An exciting new startup in the web design community is from Steven Snell of Vandelay Design. His new website DesignM.ag has already displayed some great articles and resources such as 200+ Resources for Freelance Web Designers and 11 Steps for a More Stable Freelance Income. 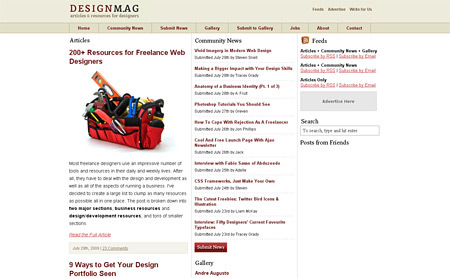 The site also features community news, design gallery and job board, definitely one to add to your feed collection! 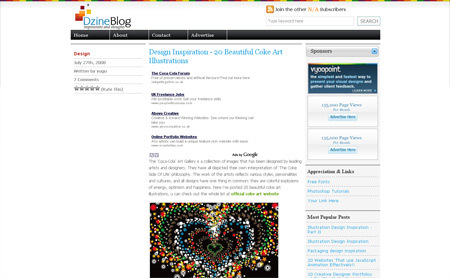 Another site that constantly pulls out great content is the blog of design studio GoMedia. Jeff Finley recently posted the first of a three part series covering 15 Awful Mistakes Made by Designers in the Music & Apparel Industry, which takes the opinions of established artists and designers from the industry and outlines their thoughts. A real useful read for anyone looking to head into the apparel industry. Twitter has become extremely popular in the design community with many designers and bloggers displaying their tweets on their websites. 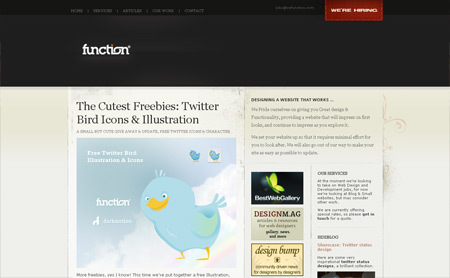 One of the most famous Twitter icons is that of Twitterific software, however despite it’s common use I believe using the icon for other purposes is actually infringement of copyright. Artwork and illustrations created for Coca Cola are always awe-inspiring. DzineBlog has compiled a roundup of 20 Beautiful Coke Art Illustrations by leading illustrators from across the world, each one shows a different personality and style based on the artist’s own interpretation of ‘The Coke Side of Life’. I received an email this week promoting a new web app named Backboard, after checking out the site and the video introduction it seems like a really useful resource for designers. Backboard gives you the opportunity to upload a file and pass on your Backboard for review, for instance you may want to upload a logo design and send it to your client who can then review the design, make comments and approve the design. In a previous roundup I posted a link to an interview I was part of at MyInkBlog. I am stoked to have been part of another interview on the ScrnShots blog, where I answer a few questions and give a little insight into my daily routine. Wow, thanks for the recommendation Chris! I’m also a fan of some of the other sites on your list like Function and GoMediaZine. 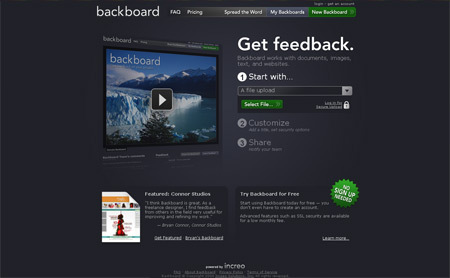 Nice – I have heard of Backboard, but didn’t know much about it – nice find! Great links! Thanks for the heads-up! 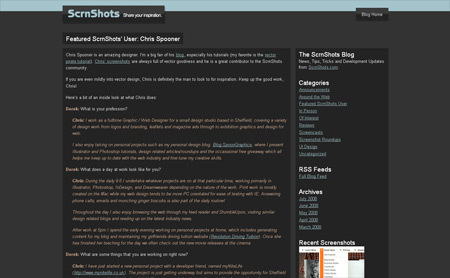 Thanks for the links, i’ve been looking for loads more design related blogs.